Wow, November already! This year is flying by. We show a tangle that we've been using for years. We recently received a request to make it an official tangle complete with step-out. 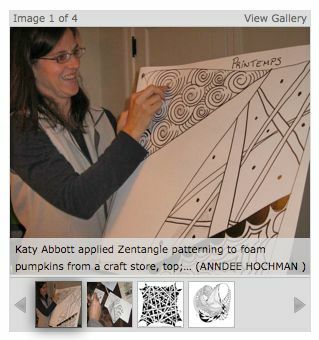 We have a link to a great article about Zentangle in the Philadelphia Enquirer. And, see below for details on the time and place where we'll be at a local book signing. I have a question that is really going to test your memories all the way to CZT Seminar 4. In our seminar someone asked what the name of this tangle was and Maria replied that it was something she has done for a long time and never named it. Then Maria asked for suggestions. A lot of different names were called out, and I raised my hand and said that I had seen that in Maria's work for a long time and whenever I saw it, I always said to myself, "there is one of Maria's Zinger's". Maria then said, "That's it," and wrote the name Zinger on the tile that was under the document camera so it was projected on the wall. The class then moved on, and I saw Maria during a break and said that I was thrilled to name her little tangle, Zinger. She smiled, grabbed my arm and said "Life is good." It was my 15 minutes of fame in CZT class-LOL! Anyway, I don't recall ever seeing it officially named. After I posted on Facebook, what I recalled above, several other CZT's from class 4 all said they remembered it being named, Zinger and have always called it that since. On that tangle, sometimes your lines are open and sometimes the are closed, but I always felt it was the same tangle (another part of the discussion). 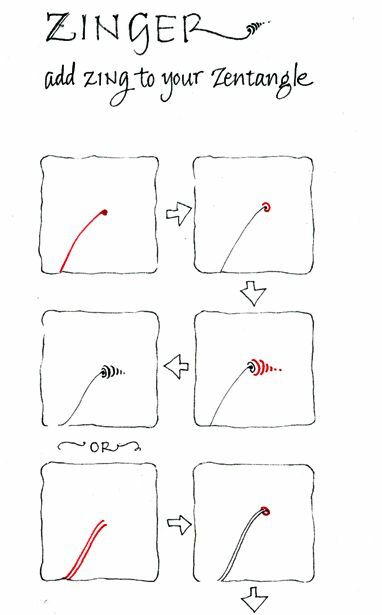 One of the CZT's from class 4 said she thought it would be neat if it was called Maria's Zinger, kind of like Rick's Paradox. I like that idea too! Do you think this is would be good to put out in a newsletter or on your blog? You don't have to tell how it was named, but just clarify that it is Maria's tangle and what the name is. Thanks! Hope you both have a wonderful holiday season with you family! Thanks so much for that suggestion, Sue! Maria began adding this to her tangles years ago almost as a flourish. This is a fun tangle to use on its own. It can also be creatively mixed with many other tangles as you will see below in these tangle tangos. "Tango" is our new term for two tangles dancing together. Just as in couples dancing, in tangle tangos, one tangle is more likely to lead and the other follow. We love how this tangle continues to sprout in unexpected places. A few weeks ago, Anndee Hochman from the Philadelphia Inquirer called and the three of us enjoyed a conversation about Zentangle. Her article just came out and we wanted to share this link with you so you could read it. 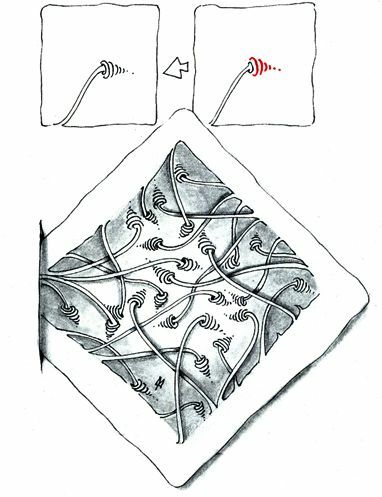 "In Zentangle, a meditative drawing practice that has scribbled across the globe since its creation nearly 10 years ago, there are no erasers, no apologies, and - as Abbott kept reminding the four women gathered around her dining room table - no mistakes." On November 24, we will be signing copies of our first book, The Book of Zentangle at The Art and Frame Emporium in Westborough, Massachusetts from 1:30 to 4:00 in the afternoon. 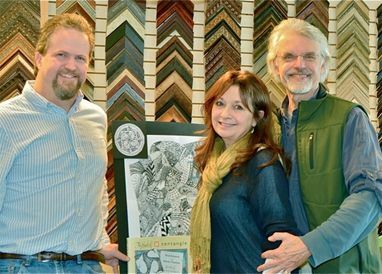 Ed Turner is a CZT and he owns The Art and Frame Emporium which is located at 18 Lyman Street in the Westborough Shopping Center in Westborough, Massachusetts.